Planning to Cruise from the Mobile Cruise Port? The Mobile Cruise Port is one of the newest, if not the newest, cruise ports in the United States. The port is ideally located close to the Caribbean and the Yucatan Peninsula and offers Western Caribbean cruises. 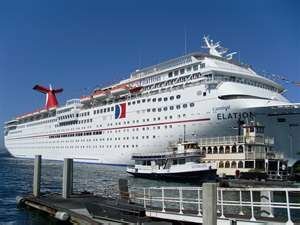 Currently, your family can find cruises out of the Mobile Cruise Port with Carnival Cruise Line to the Western Caribbean - largely Mexican cruise ports. Carnival offers a limited number of 4-night cruise itineraries to Cozumel, Mexico. Carnival also offers 5-night cruises to Cozumel and Progeso, both in Mexico. Depending on where your family is traveling from, you may choose to get to the Alabama cruise port by air or by car. Let us first look at getting to the Mobile port by air. Unlike other cruise ports which are closely located to international airports, the Mobile port is not. However, the Alabama Cruise Port is located near to one of several regional airports. Note:If you plan to fly to your cruise port, I recommend getting in overnight to ensure that you do not miss your ship the next day. Click here to find hotels near the Mobile Cruise Port. 1. Airport Shuttle - Your family may choose to travel by shared shuttle service to the port. At the time of writing this web page, the rate was $13 per person 1 way and $25 round trip. Children under 12 ride free. This is a great break for your family. You may call ground transportation at: (251) 633-0313 or (800) 357-5373. 2. Taxi Service - There are several taxi service companies to choose from such as Yellow Cab and Allied Taxicabs. Taxis are generally parked by the baggage claim curb. However, if none is available, airport staff will call for one. As usual, taking a taxi with just your family, may be the most economical way to get to the cruise port. If you live within fair proximity to the Alabama Cruise Terminal and choose to drive, you may follow this link to get driving directions or follow one of the stated direction blocks below. The telephone number to the Mobile Cruise Terminal is: (251) 338-7447. The port may be accessed by major highways such as I-10 and I-65. See below. Stay on I-65 southbound all the way to where it meets Interstate-10. Take I-10 East until you are almost at downtown Mobile and be prepared to take Exit 26A, "Canal St". This exits off the right (east) side of the interstate. Turn right at the end of the exit ramp onto Water Street. Water Street is a 4-lane road with a median and will curve back to the north toward the terminal. Stay on Water Street for two blocks. The garage and terminal will be on the right side. There will be signs directing you to baggage drop off and parking. Stay on I-10 across the Mobile Bayway bridge and go through the I-10 George Wallace Tunnel. Out of the tunnel, go three-quarters of a mile (3/4) and take Exit 25A, Texas Street. Turn left at the end of the exit ramp onto Texas St. You are now going to double back onto the Interstate. Slowly drive under I-10 and proceed to the left turn lane to the on-ramp and get back on to the Interstate, I-10 East. Once back on the Interstate, stay in the right lane for one-quarter mile (1/4 mile), then take the next exit, Exit 26A , "Canal St". Turn right at the end of the exit ramp onto Water Street. Water Street is a 4-lane road with a median and will curve back to the north toward the terminal. Stay on I-10 eastbound almost to downtown Mobile. Be prepared to take Exit 26A, "Canal St". Turn right at the end of the exit ramp onto Water Street. Water Street is a 4-lane road with a median and will curve back to the north toward the terminal. At exit 9, take ramp right for I-165 South toward Prichard / Downtown Mobile (5.2 miles). Keep straight onto N Water St (0.7 miles). Keep straight onto S Water St (0.1 miles). Turn right onto Government St (0.2 miles). Keep straight onto Government St (0.2 miles). Turn left onto S. Claiborne St (0.4 miles HOLIDAY INN on the corner). Turn left onto Canal St (0.1 miles). Keep left onto Henry Aaron Loop/Canal St. (0.2 miles). You will be turning right onto Eslava St. If you are able to drive to the Alabama cruise port, you will need to park. Parking for regular-size vehicles including cars, minivans and SUVs is $18 per day. This means that a 4-day cruise will cost your family $72. Oversized vehicles pay more: RVs pay $36 per day, and, buses pay $54. There are about 500 parking spots closest to the Mobile Cruise Terminal. However, whenever the parking lot closest to the terminal is full, others will be escorted to parking spots a short distance away. I hope that you find the information presented here useful as you plan your all inclusive Caribbean cruise sailing out of the Mobile Cruise Port in Alabama.